Is that title too blunt? Hehe. Maybe Tim Burton is your favorite. I’ll be honest though, I was shocked when I first heard that he would be at the helm of the live-action Dumbo project. Shocked, terrified, same thing. You know I don’t watch many trailers anymore, but I had seen some stills from the movie… and started to wonder if maybe, just maybe, it would be a little toned down. 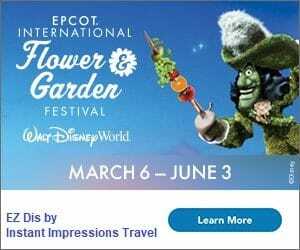 A little less…. Burtony. Thanks to the Disney studio screening we were able to attend tonight, I happy to report that my my fears were unfounded. It’s an absolutely lovely movie, and I can’t wait for you all to see it. 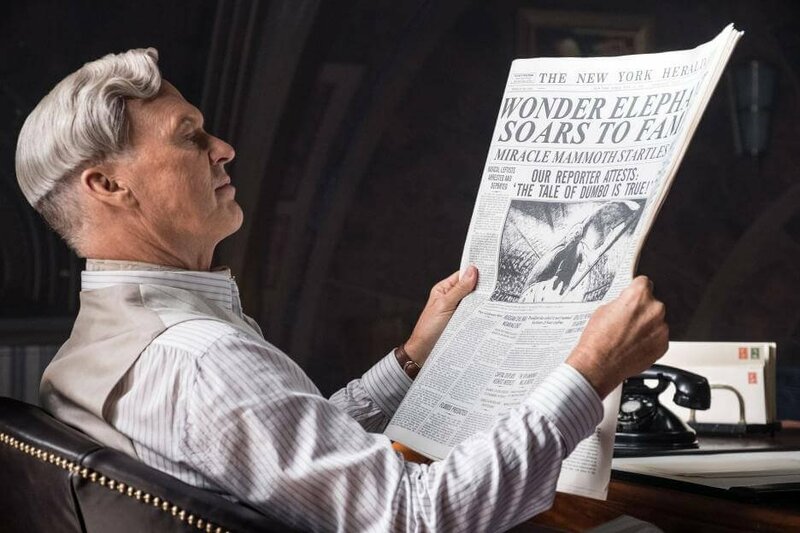 Producer Justin Springer said, “We really wanted to explore the human side of [Dumbo’s] story and give it historical context.” They did both of those things so very well. Set in 1919, a father returns home from war to a family and community that has been forever changed while he was away. He and his children have to learn how to cope with a new normal, as do many of the other characters. Adults learn to believe in their children’s dreams; children learn more about their parents as more than caretakers. Nearly everyone has to learn how to make right choices, even when it isn’t the easy or appealing thing. There are so many beautiful lessons and things to talk about after seeing Burton’s Dumbo. The casting was quite good, and the performances were excellent. There are definitely moments that felt, for lack of a better word, kind of weird. But they were never more than fleeting scenes, and I actually think they worked to bring a little extra charm to the film. Keaton is once again a phenomenal, slippery villain. Alan Arkin is quirky and perfectly Alan Arkin, and Danny Devito and Colin Farrell are really great. 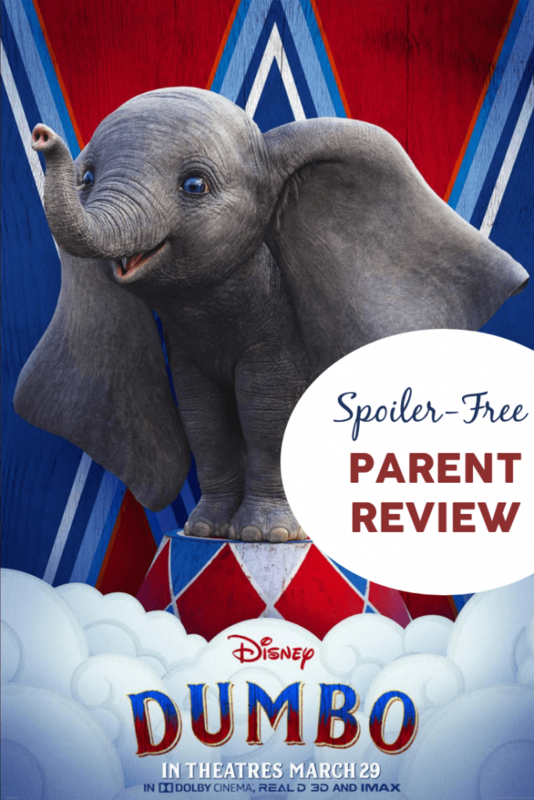 Parent Perspective: Is this Dumbo ok for kids? As I’ve mentioned before, we’re really quite conservative with what our children watch. On the way to the theater tonight I realized that perhaps I should have watched this one before taking the kids, but it was a little late. I prepped them that it may be a little darker, more intense, realistic… and that we’d just have to close our eyes if it was too much. Thankfully, I had nothing to worry about. 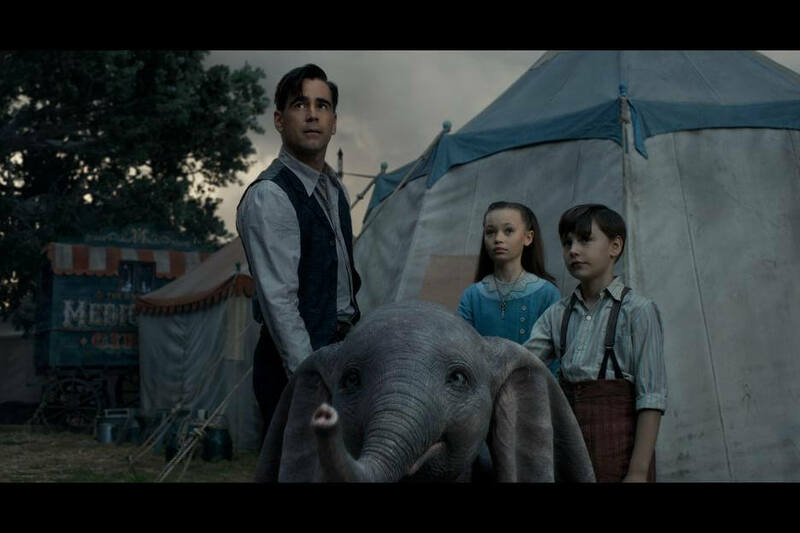 There were some scary scenes reminiscent of the big top being brought down in the original Dumbo (or if you’ve seen The Greatest Showman, reminiscent of the circus performers having to escape the fire); if you think that will be problematic, maybe give the movie a screening before your kids see it. There are two uses of the word ‘hell’, which my children all three pointed out to me more than once. A character almost uses another moderate curse word before being cut off by his children. Other than that, I don’t believe there is any other language of concern; there aren’t even many insults or name-calling instances except from one character, whose poor behavior is very quickly, um, rewarded. 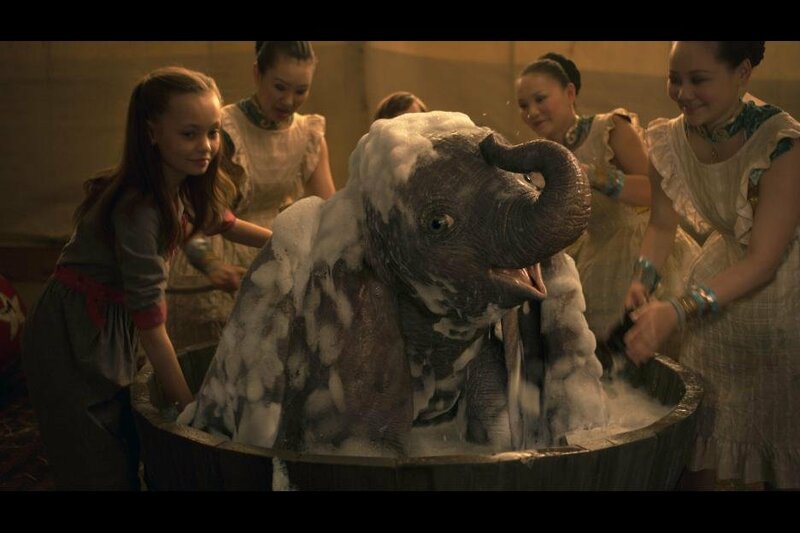 There are several characters that are just plain cruel – to Mrs. Jumbo and Dumbo, to one another, to just about anyone. At one point, we were all really concerned for the safety of some of our animal friends; some of that may be too much for sensitive kids. That said, for whatever reason, even my kiddos that are usually very susceptible to feeling a little too strongly during movies only sobbed during “Baby Mine”. As we all do, every time. How does the 2019 Dumbo compare to the original? What I didn’t expect though, was just how many detailed homages there would be. Storks fly by, signaling the birth of the new baby elephant. Dumbo meets a mouse friend or two. A little girl in the stands carries her Winnie the Pooh plush, and a rack of Dumbo plush for sale at the grandstand matches the one my son brought with him to the screening – the one I got almost eleven years ago when my girls were babies. For a fleeting moment, I was even pleased to see this little jerk and his friends. I was even pleased to see a little punk that reminded me of this guy from the original film. 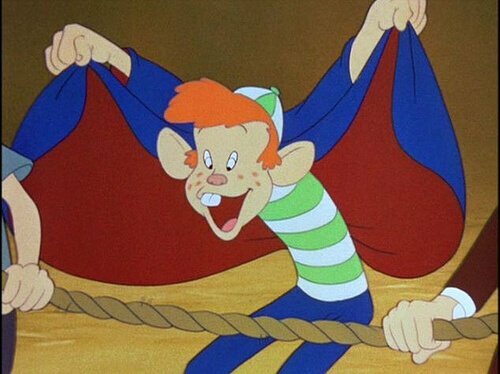 It’s very clear that a lot of love was give to the original while making this Dumbo. I’m not exaggerating when I said I was worried it would be ruined, but I don’t think this is a case of low expectations making it seem like a good movie. I think it really is a good movie. And hello, this little guy is one of the cutest things I’ve ever seen. 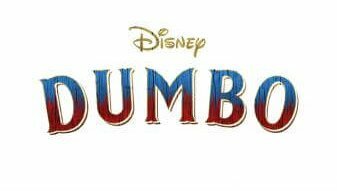 I can’t wait to hear what you think about Dumbo!